It only takes 1 wire. Telemetry is a great thing, It essentially puts important vitals about your quad onto your transmitter. Sure, with an OSD, you get the same thing, but it is nice to have an alarm on your Taranis for when things go wrong with your OSD! It is also a good reminder to have a radio alarm that talks to you with haptic feedback when your voltage gets low. Lets face it, sometimes it’s easy to focus on the flying more than the voltage. I have had this problem before, so creating an alarm in the radio using Telemetry is a great idea. There are different ways to setup your telemetry depending on whether you are using Baseflight or Cleanflight. The D4R-II connection is the same regardless of which software you use. The Telemetry is a one-way communication, and therefore, you only need to connect the Tx (transmit) line from the Flight controller, to the Rx( receive) line on the D4R-II. There are 3 ways to get the telemetry data back to your Taranis. The standard pins on the board labeled telemetry are a good choice if you are not going to run any additional electronics. Use this option if you are not planning to add other electronics to your Naze32 like a OSD, Bluetooth, etc. With this option you will use a real UART (serial) port to send the data to your FrSky receiver. Note that when you uses this option, you can’t use the regular tx/rx pins anymore since they are shared with the FrSky pins on the Naze32. The Naze32 UART is shared with the USB port and the TX&RX pins on top of the board so if you choose this method, you cannot use the USB or the TX & RX pins. If you are planning on using either of these, then you will have to use a soft serial and option 2 or 3 below. Use this option if you are planning to connect several electronics to your Naze32 that will use serial data like a OSD, Bluetooth etc. We will output the telemetry data through a softserial port. This is a “virtual UART”, so not a real UART (some say this slows down the Naze32. We have not found there to be a difference in our testing). You MUST use PPM for this to work since we need the RC input pins! Set the softserial port 1 to inverted, since that is the way the FrSky protocol works. This option is the same as above, but it sets the soft serial output on pair 7&8 instead of 5&6. You MUST use PPM for this to work since we need the RC input pins! FrSky telemetry is transmit only and just requires a single connection from the TX pin of a serial port to the RX pin on an FrSky telemetry receiver. FrSky telemetry signals are inverted. 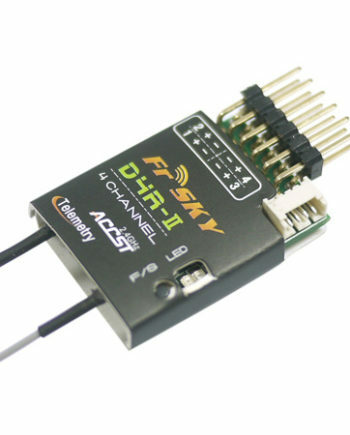 To connect a cleanflight capable board to an FrSKy receiver you have some options. A hardware inverter – Built in to some flight controllers. Use software serial and enable frsky_inversion. Then setup your ports in the GUI: You have to start with the configuration screen: You must be using PPM or a serial connection to your receiver in order to be able to enable soft serial select SOFTSERIAL and the TELEMETRY checkboxes, Click save. pull down the menu to FRSKY and set the baud rate to auto. cleanflight Frsky Telemetry instructions and how to. If all went well, now when you hold the page button down on your Taranis, you should see some telemetry data. Telemetry can be easily setup in Cleanflight and in Baseflight. It's a one wire connection, tx from the flight controller to rx of the d4r-II telemetry pins. The serial port has to be inverted in order for it to work. We like to use soft serial ports, which are related to pins 5,6,7,8. Pins 5 & 6 are related to soft serial 1 and pins 7 & 8 to soft serial 2. Pin 5 is rx, 6 is tx, 7 is rx and 8 is tx respectively. We choose to use the GUI in cleanflight because the way that the port setup in the cleanflight CLI is is pretty bonkers. Baseflight is the easiest to setup, You simply type in the cli commands listed and it works. We hope that helps you setup telemetry on your quad. Should step 4 not set softserial port 2 to inverted, not port 1? 4.Set the softserial port 1 to inverted, since that is the way the FrSky protocol works. I followed the instructions and am using the D4r-ii with jumper in place for CPPM. I have a Flip 32 and after searching on the net I found the pinout to connect the green and black wires to the correct place on the Flip board. I see the RSSI, A1 and A2 voltages which I have selected in the TX (Taranis running 2.1.7) but the A2 only shows the same voltage as A1 – 5V even though I have a 3S lipo supplying power. I am using Cleanflight 1.12, the command lines on CLI are a little different. For example to invert telemetry, i use ‘set telemetry_inversion = ON’ that allows me to get telemetry on UART1. I was wondering what is the soft serial inversion command, i’ve tried yours and several other variations with no success. Wondering if you could help? When i type in ‘set telemetry_inversion = 1’ it says invalid value. I think it has changed to ‘set telemetry_inversion = ON’. This is works fine when I have FrSky telemetry set on UART1. However now i’m trying your recommendation of using Soft Serial port for telemetry, how do I invert soft serial port? Tried your command lines but dont seem to work, command lines must have changed in the previous cleanflight versions. Hi Anthony, seems to be working now, somehow when I set telemetry inversion, it doesnt save it all the time when i exit. Seems like I do not need to invert the softserial port, just set telemetry inversion and it worked. Using D4r-II, Taranis Plus, Naze Afroflight rev6. TX, RX and OpenTx are updated to latest versions. Connected D4r from the RX pin to pin 6 on the Naze. on configurations page Soft Serial and Telemetry on. Cleared all the telemetry from the Taranis, and detected sensors. All I get is four items SWR, RSSI, A1, A2. I can not see Cell,Cells, etc on the Trananis or in OpenTx when connected. re-read all the instructions, and watched Painless360 several times. any ideas what is wrong? Many thanks. If that doesn’t work, post a dump of your settings. If you look through the dump you should see something in there about telemetry inversion which should give you a clue as of what command to use. Member of Facebook Taranis group, pointed me to the link below which solved the issue for me, now I have all the telemetry. nach dem Umbau der Telemetrie zum FrSky D4R-II funktioniert mein GPS empfang nicht mehr. Ich habe die Telemetrie an Softserial 2 also Pin 8 angeschlossen. Das GPS Modul ist an Pin 5 und 6 des Skyline 32 Flightkontrollers angeschlossen. Wird das GPS Modul dadurch beeinflusst? Ich habe technisch keine grosse Erfahrung, kann mir jemand sagen, was ich im CLI des Baseflight Configurators ändern muss? after the conversion of the telemetry to the FrSky D4R-II my GPS does not work anymore. I connected the telemetry to Softserial 2, pin 8. The GPS module is connected to pins 5 and 6 of the Skyline 32 flight controller. Is this affecting the GPS module? I have no great technical experience, can someone tell me what I need to change in the CLI of the Baseflight Configurator? I Checked the Soft Serial Betaflight Wiki and I don’t see that the skyline 32 has documentation for SoftSerial support. I could be wrong. You could try entering these commands into the CLI. Honestly though, It sounds as though you are exceeding the capibility of the FC and using softserial can cause adverse performance on STM32F1 hardware. I would recommend upgrading your Flight controller to a newer F3 model such as the DTFc so that you can run the additional UARTS you need.